Here's your chance to be in a book about home staging! Here’s your chance to be in a book about home staging! I’m working on my latest book which will be published in 2010 and featured on Amazon and elsewhere. The exciting news is that you can be in it if you’re a home stager with an interesting story to share. Don’t worry — you don’t have to be a professional writer to participate! We will edit your story if it is chosen for inclusion in the book. a time you donated your staging services to help someone in need. 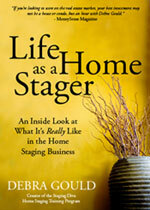 how your staging career has effected other aspects of your life. I’ll be including many of my own stories from the past 7 years of staging clients’ homes, but I’m looking for your story too. My goal is to paint a picture of “a day in the life” of a home stager to give aspiring and fellow home stagers an opportunity to learn from our experiences and integrate the lessons-learned into their own businesses. Remember you don’t have to be a professional writer. Anything you submit will be edited, you just have to give us the interesting story to start with. If you’re selected, you’ll get a free copy of the book once it’s printed PLUS the bragging rights of saying you’re featured in a published book, adding to your own credibility as a home stager. Although there are many, this one really touched me personally and showed me the opportunity we have as home stagers to make a positive impact on someone’s life. A realtor came to me for help. Her client, a single woman in her 60’s owned a 1950’s “original” in the suburbs of Minneapolis and had purchased a town home near her sister who’s health was failing. After 11 long months of unproductive showings and a devastating liver cancer diagnosis, this woman was fatigued, extremely discouraged and at risk of losing both homes within a matter of months. The realtor had priced the property to sell, marketed it like crazy but still nothing. It was out of her passion for excellence and her heart for her client that she turned to me, even though she didn’t know how the funds would possible be there to do much and it needed much. After meeting with them and seeing the home’s hidden potential, the team and I came up with a plan to expose it’s true charm– hidden under dirty old carpet were beautiful hardwood floors and the dingy white walls were hiding the great coved ceilings and unique archways that gave this property character. Because of this woman’s personal situation, we wrote up a plan to cover $1000 in expenses and all fees would be paid on the sale of the property. It just felt like the right thing to do. We got to work ripping out carpet, sanding floors, painting the cabinets and walls, updated the lighting and hardware and some other small fixes. Before the week was out or the renovations were finished, we had a bite! We lightly staged the property with furnishings and accessories and within two weeks, it was SOLD. Her entire family was touched by this situation. Kathryn has since settled in to her town home, close to her sister and both ladies are doing well. When I think about the stress and weight our ability to come in and see her properties potential and how easily we were able to make these changes, it blows my mind this gets to be our job. Thanks for allowing me to share Debra! Karisa, Thanks for sharing your wonderful story. I did a similar thing for a woman who had a stroke and needed to sell her home quickly to pay her medical bills. We really do work miracles for people in all kinds of situations. That’s one of the reasons I believe if you have the talent to do this kind of work, you really can’t sit on it. You need to share it with the world. We can be of so much service, do what we love AND make money at it. What could be better than that? !